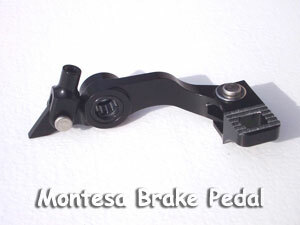 Replace your stock Montesa brake pedal with our beautiful machined billet pedal. The V-Mar pedal is a bit shorter than the stock unit so it is easier to reach, especially if you have moved the foot pegs farther back. The tip is hinged to deflect when you get a little too close. Comes complete with new bearing and seals and a new billet clevis. CNC machined from 6061 and 7075 aluminum and black anodized.